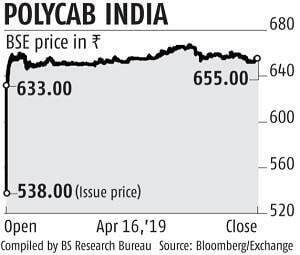 Shares of Polycab India, a leading manufacturer of electric wires and cables, ended 21 per cent higher over its issue price during its stock market debut on Tuesday. The stock ended at Rs 653, compared to the initial public offering (IPO) price of Rs 538 per share. The stock touched a high of Rs 668 and a low of Rs 630 on the National Stock Exchange, with nearly Rs 1,500 crore worth of shares changing hands. This was the best listing-day performance for a company since HDFC Asset Manage­ment Company’s (AMC’s) stock market debut in August 2018. Shares of the asset manager had soared nearly 60 per cent on Day One. Polycab’s listing-day spurt follows huge response for its IPO last week. The Rs 1,345-crore offering saw 50 times more demand than the shares on offer. Institutional investors’ portion of the issue was subscribed 93 times, while the high networth individual portion garnered 110 times subscription. The IPO also saw over 1.1-million investor applications. 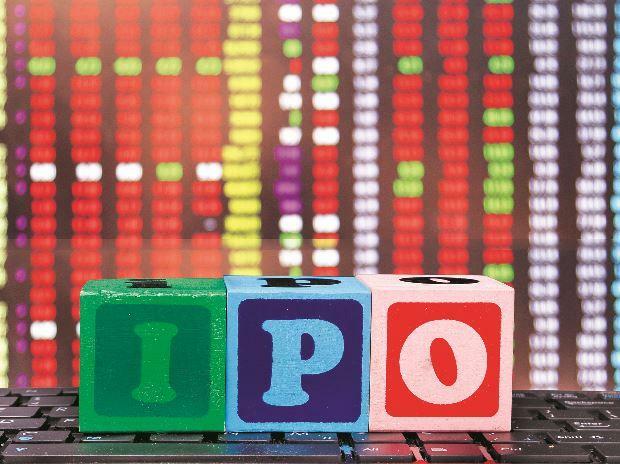 The oversubscription for Polycab’s IPO was also the highest since HDFC AMC’s Rs 2,800-crore offering last year. At Tuesday’s closing price, Polycab is valued at Rs 9,736 crore. Some of Polycab’s listed peers include Havells India (valued at Rs 47,380 crore), Bajaj Electricals (Rs 5,910 crore), and V-Guard (Rs 9,650 crore). Most brokerages had recommended their clients to subscribe to the IPO, citing attractive valuations relative to peers. “The issue is priced at price-to-earnings multiple of 21.6 times (after dilution) on 2017-18 basis, compared to the average industry composite of closely comparable listed peers at 44.6 times,” said Centrum Wealth in a note. Over FY16-18, Polycab registered revenue and profit compound annual growth rate (CAGR) of 14.2 per cent and 41.6 per cent, respectively, with average earnings before interest, taxes, depreciation, and amortisation margin of 9.7 per cent. The domestic wires and cables industry is pegged to grow at a CAGR of 15 per cent till 2023.